In most standard apartments in our country, bathrooms are of more than modest in size. On 3.5-4 square meters (up to 45 sq. feet) it is necessary to place plumbing fixtures with accessories, storage systems and, in some cases, even a washing machine. At the same time, it is important to create not just a functional room, but also an aesthetic comfortable atmosphere in which you can relax at the end of the day and be charged with energy at the beginning of the next one. The task is not simple, but feasible. Over the years working with small utility spaces, designers have accumulated considerable experience in creating a rational design of the hygienic premises. If it is not possible to increase the room’s size physically, then it is necessary to provide visual expansion of space with the help of effective design techniques at least. 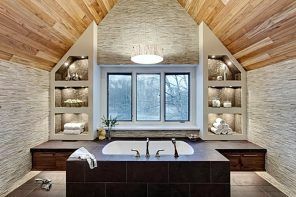 Examples of such design methods, as well as effective layouts of plumbing within the framework of small bathrooms, you will find in our selection of 100 small bathroom decoration modern design ideas. The possibility of installing a forced ventilation system (as a rule, there are no problems with this point in the apartments of the most varied modification). It is also necessary to think in advance about the model of sanitary ware, which you will install in the bathroom, because not only the layout of the premises, but also its appearance largely depends on their size and design. Modern manufacturers has wide choice of models of baths, shower cabins, sinks and bowls of the most different forms and sizes – the owner with can find a variant suitable bathroom on any budget. 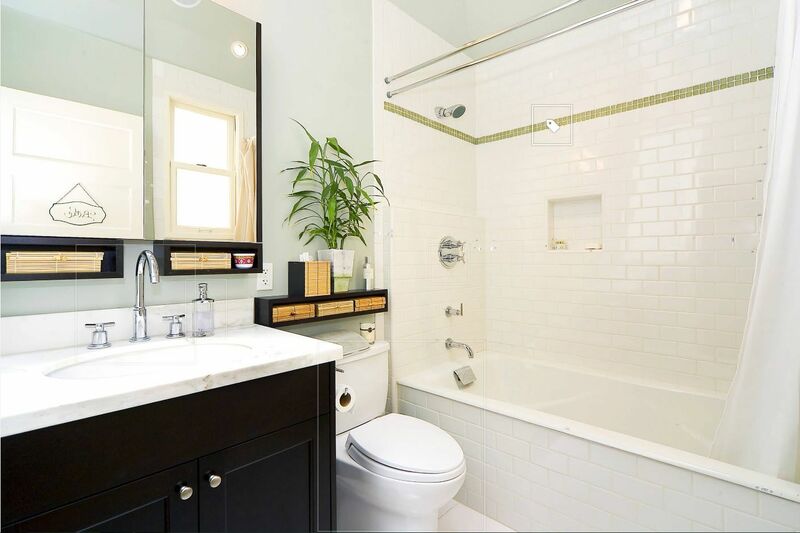 Decide on the interior design style of the bathroom. Unfortunately the options for creating a truly original, exclusive design within a premise with an area of ​​3.5 sq. m are few. Designers recommend adhering to the modern style, which tends to minimalism. 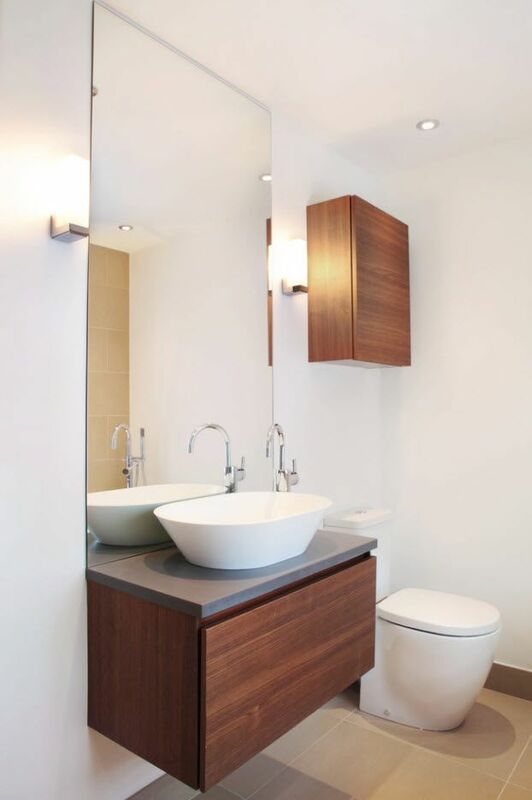 Simple and concise design with a minimal amount of decor, a strict set of sanitary ware without bulky storage systems is the best option for designing of a small bathroom. 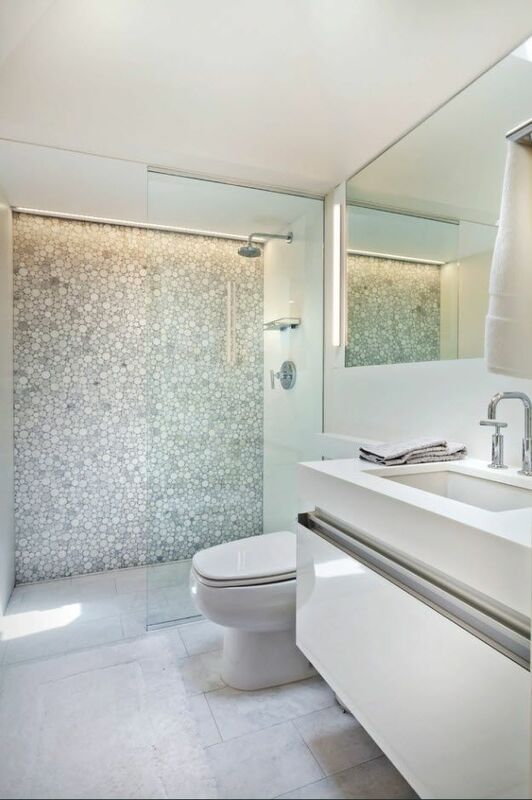 People, who are accustomed to the need to design small utilitarian premises, know well that light colors will help to decorate a modest bathroom area not only with the adding lightness and freshness to the interior, but also visual expansion of space. For most of us, white color is a symbol of cleanliness and freshness, which are so necessary in the room for water and sanitation procedures. But do not focus on light surfaces only because the bathroom has a modest size. Color accents are also necessary to save all household members from persistent associations with the hospital ward or operating room, which is certainly clean and even sterile, but absolutely uncomfortable. But the bathroom, no matter how small it is, is not only designed for performing basic functions to provide opportunities for water procedures, but also for relaxation. In large families, the bathroom is often the only place for privacy. Agree that this space must be decorated with special care. So, how can you brighten the shades (which, of course, will prevail in the design of a small room)? The abundance of white surfaces always creates a somewhat cool indoor atmosphere. Designers recommend to “dilute” the snow-white tone with the integration of wooden surfaces. This can be the facades of storage systems (most often small boxes under the sinks, less often – hanging cabinets and open shelves), imitation wood on ceramic tiles, which is used for flooring or decorating a splashback over a bathroom or sink. Even in a very small room, you can’t execute all surfaces in white. The floor covering must be decorated at least 2-3 shades darker. This is necessary to create a favorable, from the point of view of the emotional state, picture of the interior. If the floor covering is made in light tone, like the walls and the ceiling of the bathroom, it creates a feeling of lack of form in the room. You can use the imitation of wood or stone, choose a tile with mottled ornaments or one-color version, but not the light one. In addition to white color, there are many color options for creating a light, calm finish, which will not make the image of a small room more complicated and help to create a relaxing atmosphere. All pastel shades are suitable as a basis for wall decoration in a small bathroom. Light beige tones, among other things, will help create a warm, relaxing atmosphere. In addition, snow-white plumbing looks more spectacular against the background of beige walls. Add contrast to the light image of the room with darker color solutions for flooring or storage systems. Different shades of gray can be used to decorate a small bathroom space. Not only the whiteness of sanitary ware, but also the gloss of chrome accessories for the bathroom – various holders, mixers, faucets, will look great against the gray background. Light gray tone can be taken as a basis. And with the help of darker, deeper shades you can emphasize the geometry of the room or highlight one or another functional area. You can influence the visual perception of the room, its dimensions and boundaries with not only color of the main surfaces. Small color inserts, different edging, and location of the print on the tile – you can achieve positive effects to create a comfortable image of a small bathroom with the help of various design techniques. For example, the location of a narrow border or colored insert in not the middle of the room but slightly higher, will visually increase the height of the room. Can such a design technique as an accent wall, highlighted with rich color, organically fit in to a small bathroom? Designers unanimously say “yes”. Standard size bathroom and even a room of irregular shape can benefit from the presence of a colorful finish of one of the surfaces. It will not visually reduce the space, but will emphasize the form of the utilitarian room. Most often people choose the shower area for a bright or contrast dark execution, but you can use the wall behind the bathroom or a washbasin with a mirror as an accent surface. Modern manufacturers are guided by the needs of customers. Demand for compact models of plumbing devices does not decrease despite the improvement of the quality of life, the increase of the possibilities of utilitarian spaces in apartments and private homes. Pay attention to the hanging models of sanitary ware – toilet bowls and sinks. They are built into specially created niches, where it is possible to hide all engineering systems. Console models can save much needed centimeters of useful space in small rooms. Not to mention the aesthetic side of the issue, because a suspended toilet bowl or sink that are built into a wall without any external pipes is an excellent solution for a modern and stylish image of a bathroom. If your bathroom is a room of irregular shape or looks like a very elongated rectangle, which becomes a particularly problematic issue for decorating in addition to of a small area, then only a compact shower can save a useful space. In the lines of modern manufacturers there are models with a bottom size of 70×70 and 80×80. 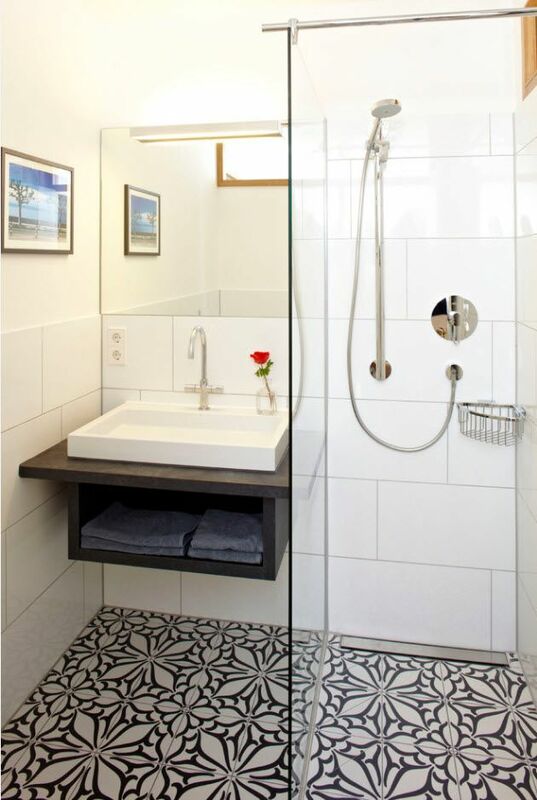 Such modestly sized shower cabins are effectively built into niches (or occupy the entire width of a small bathroom), but at the same time they perform their basic functions perfectly. If the shower cabin as an alternative to taking a bath is not the agreeable option for your family, then the bathtub should be located along the width of the room. In this case, you will have to choose the model that most closely matches the size of the room, regardless of your personal preferences and even the growth of the household. In small spaces, it is often necessary to sacrifice partial comfort for the correct arrangement of plumbing devices. If there are those who like to soak in the bath and those who prefer the invigorating effect of a contrast shower in your family, it will be necessary to equip the bath with additional elements. In order to be able to shower standing in the tub, you do not need much – a holder for a shower diffuser, fixed to a wall and a glass partition, protecting the bathroom space outside the improvised shower. The glass partition does not weight the image of the bathroom, but at the same time reliably protect it from splashing water all over the space. For a small space, light is one of the most important elements of composing an image of the interior. It is the main assistant in the matter of visual increasing the volume of the room. Reflecting from mirrors, glossy and glass surfaces, light spreads throughout the area of a small utilitarian room. That’s why the ceiling light alone will not be enough. Spot lighting around the perimeter of the ceiling, mirror illumination, the use of LID stripe lighting or a combination of different lamps by design and modification – options are possible even in a small space. Already mentioned more than once mirrors can be attributed to both functional and decorative elements of the interior. No bathroom can do without a mirror, and it becomes not only a mean for reflecting objects in a small space, but also serves as a visual expander of the room’s volume. If instead of a regular mirror over a sink, you install a large mirror sheet, possibly occupying the entire width of the room, the boundaries of such a bathroom will be literally erased. Not to mention the repeated reflection of artificial light. In mirror surfaces, which often serve not only as reflective elements above the sinks, but also as splashbacks, it is possible to drill holes for mounting luminaires or outputting communication systems and installing a mixing faucet. You can set the tape backlight on the perimeter of such a mirror panel or in the lower part for intensification the adorning effect. If you decide to use hinged storage systems above the sink, you can safely purchase a locker with mirrored doors. As a result, you will get a multifunctional piece of interior: a storage system, a mirror surface for reflecting light and visually increasing the volume of the bathroom and an original design element. Mirror facades can be smooth or have fittings. It is important to understand that fingerprints will remain on smooth door without handles. For decorating in a small bathroom, there often simply does not remain a possibility. To avoid fragmentation of the image of the room into small parts, designers do not recommend overdo with decorating the interior and also to minimize all accessories, additional elements of the interior. And yet, we always have the opportunity to bring color, originality and diversity to the light and often boring image of the room with the help of household items, which are indispensable in any bathroom – bright towels or shower curtains, rug in front of a sink or bathtub, original sets of bath accessories, various dispensers and holders. Such functional interior items as mixers, shower heads, taps, towel warmers, paper holders, towels, various dispensers can appear as decorative elements. 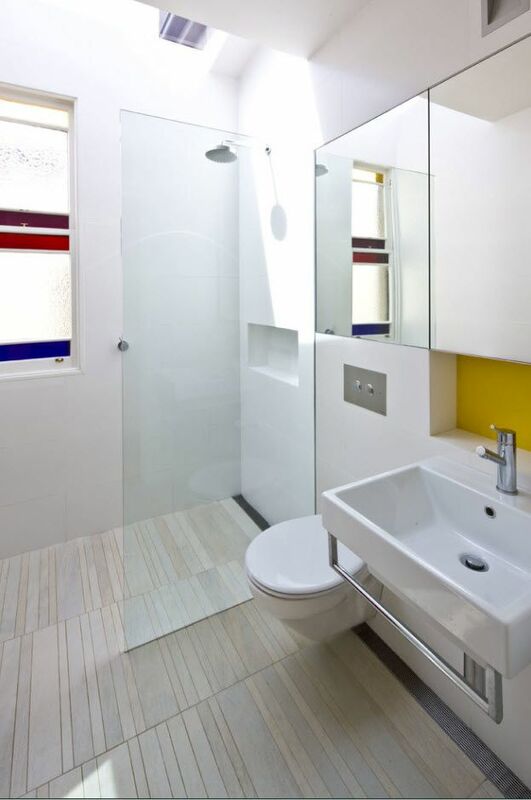 The original design or unusual material of execution (surface coating) not only diversifies even the most trivial interior, but also raises the degree of uniqueness of the design of a small bathroom. Under conditions of the most severe space saving, effective storage becomes a priority in the organization of the bathroom environment. It is important to distribute the necessary household items and bath tools in the smallest number of storage systems. Separating liners for drawers and hidden hangers, hooks and other devices, which are plenty in modern sanitary ware shops and bathroom accessories, will come in handy.